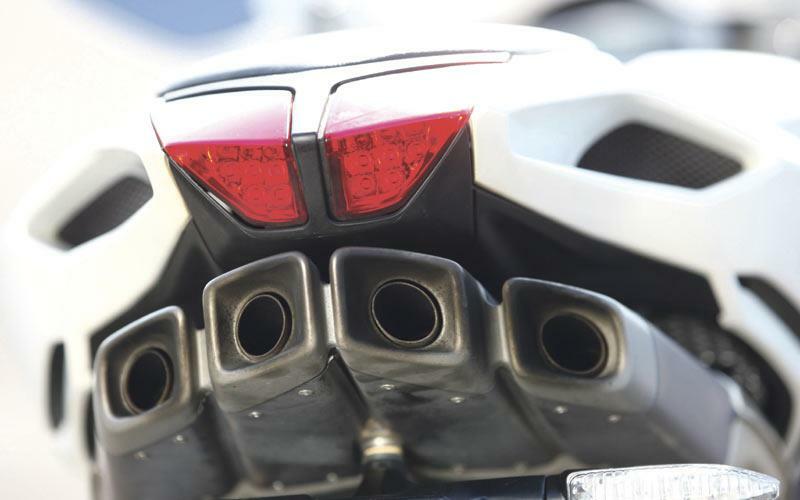 It’s the most powerful and refined F4 MV Agusta has ever produced. Making a claimed 201bhp at the crank, it just pips the ZX-10R’s 200.1bhp crank figure to make the Italian beauty the most powerful 2011 road-going superbike. It has a new short-stroke engine (hence the Corsacorta tag) with an exhaust note to die for, traction control, Ohlins suspension, an adjustable chassis, lightweight wheels and Brembo monobloc calipers. It’s still a heavy machine, doesn’t have the agility or friendliness of its rivals and its traction control isn’t up there with the Aprilia, BMW and Kawasaki systems. But ridden in isolation it’s fantastically fast, the Ohlins provides light steering and a beautiful ride and the Brembo brakes are proper racing grade. 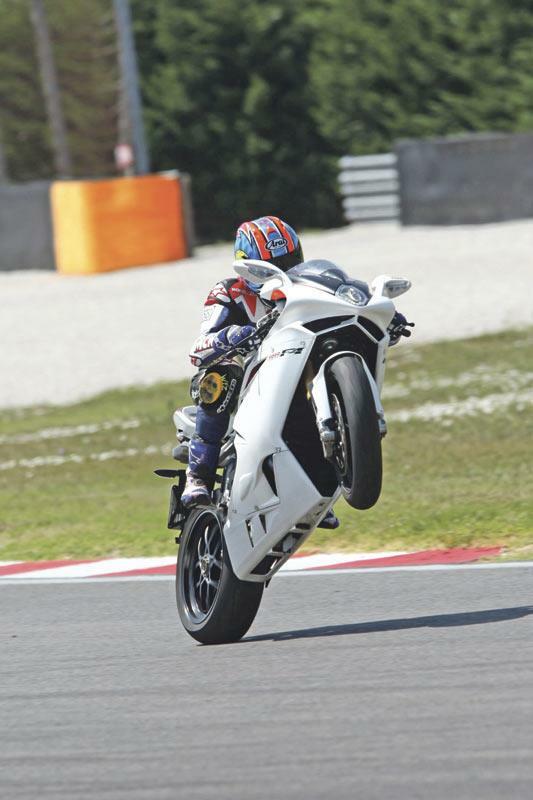 The test bike we rode at the Adria circuit in Italy had a pronounced flat spot around 9-10,000rpm, but MV say this could be an isolated problem with the electronically-operated inlet trumpets. 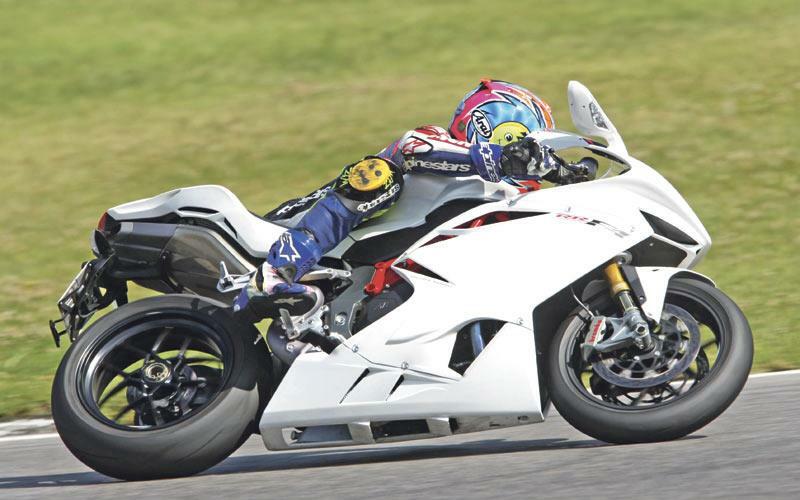 Heavy in superbike terms, the 192kg (claimed, dry) F4 RR has light steering, goes exactly where you point it and the chassis gives you lots of feel for what the super-sticky Pirelli Super Corsa SP tyres are doing . 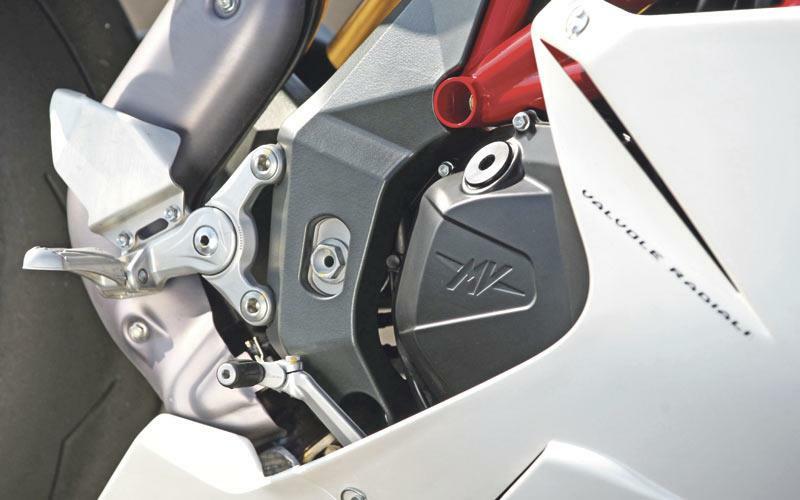 Like the Aprilia RSV4 Factory APRC, the RR’s chassis is fully adjustable. 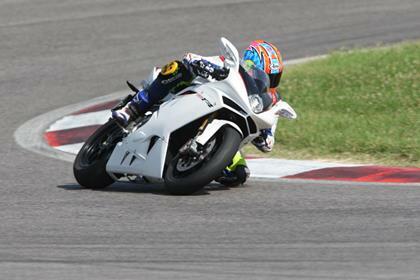 You can change the steering head angle, swingarm pivot and the single-sided swingarm’s axle position. It also has adjustable rearsets. 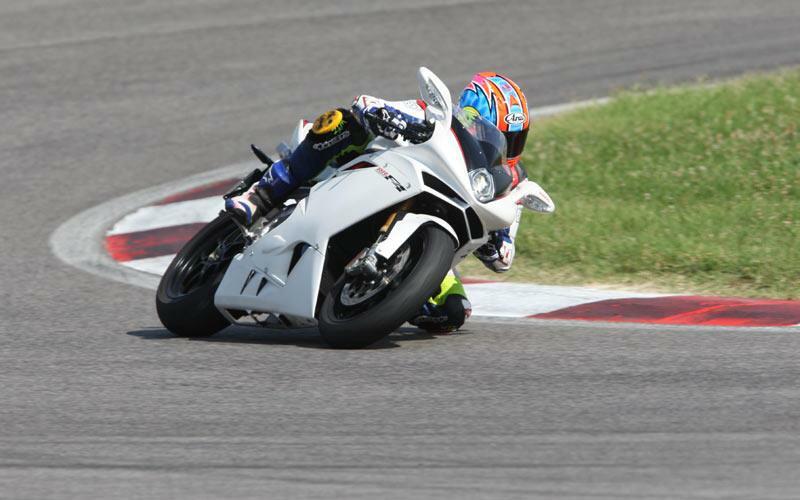 Although still a 998cc, compared to the standard F4, the RR’s bore is increased from 76 to 79mm and the stroke reduced from 55 to 50.9mm. The rev limit is raised to 13,700rpm. There’s a new primary drive, cylinder head, large-diameter titanium intake and exhaust valves and aerospace-grade alloy lightweight pistons. It also has a new removable cassette close-ratio gearbox and electronically-operated, variable height inlet trumpets. There’s no question the RR is beautifully-built and uses some of the best components you can buy. 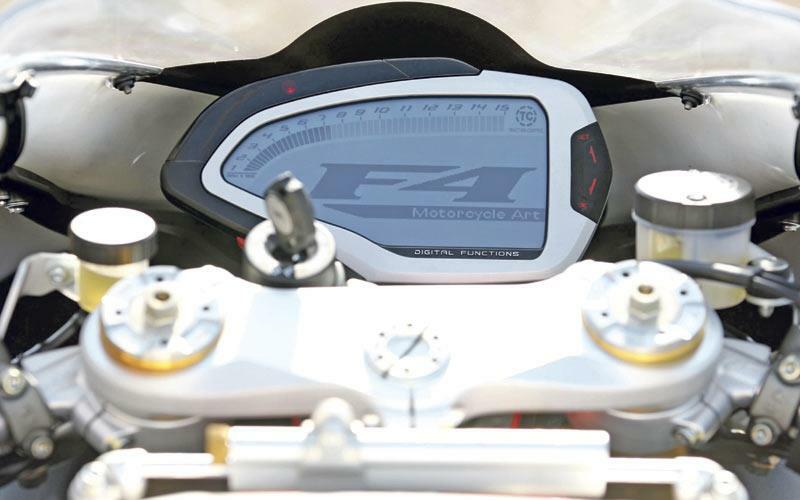 We haven’t heard of any major problems with F4s, but spares back-up and dealer issues have been voiced by MCN readers in response to reviews of other F4 models. This is the two-wheeled equivalent of a Lamborghini. It might not have the ultimate performance of its rivals and it’s a lot dearer, but it’s such a stunner and sounds so fantastic, what would you give to have one in your garage right now? 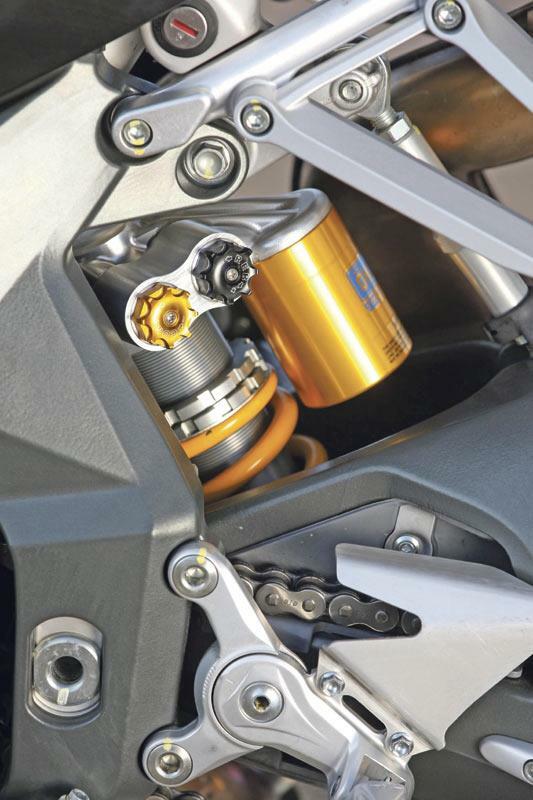 For the first time on a full production F4, the RR comes equipped with Ohlins suspension – fully-adjustable forks, a steering damper and TTX rear shock. You also get a multi-function LCD dash, now handily operated via a switch on the handlebar, an eight-stage traction control system, a slipper clutch, Brembo brakes, lightweight wheels, beautiful styling and a tasteful satin-finish paintjob. Frame type Tubular steel trellis frame with single aluminium sided swingarm. Rear suspension Single Ohlins shock, fully- adjustable. Front brake 2 x 320mm discs with Brembo monobloc four-piston calipers. Rear brake 210mm single disc with four-piston caliper. 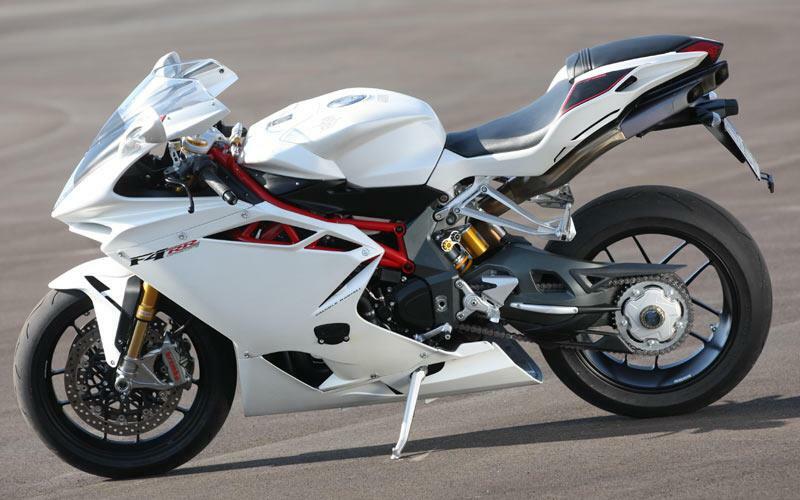 1 owner has reviewed their MV-AGUSTA F4 1000RR CORSACORTA (2011-on) and rated it in a number of areas. Read what they have to say and what they like and dislike about the bike below. This F4 is such an improvement of the older version. It is expensive (and there is plus plus costs) but it is stunning and very very special.